I opened the wrong envelope too! The Best Picture award debacle at the Oscars last night was apparently due to the wrong envelope being given to the presenters, Faye Dunnaway and Warren Beatty. I have been trying to follow the instructions on how to review the y-DNA results for my grand uncle, Ernie Coffman and I feel like I have been trying to open the wrong envelope. Click on myFTDNA in the top left corner and find the Y-DNA menu. From the Y-DNA menu, select Y-STR Results. I tried logging into my personal kit number 536433 but there were no Y-DNA results there which stands to reason since I have not yet tested my Y-DNA. I tried logging into Ernie's kit number, 609008 even though I did not recall ever setting up an account for him but that did not work either. After several attempts to figure this out over the last five days, I decided to call the customer service line at FTDNA. While I was on hold waiting for customer service, it occurred to me that I could try generating a password reset for Ernie's kit number. Finally, that worked. But I stayed on the line with customer service to recount my experience. The representative was very gracious and helpful. He offered to forward my concerns for follow up. He also helped me navigate to the Y-DNA dashboard which shows the haplogroup for Uncle Ernie Coffman to be R-M269. So I can relate to Warren Beatty's dilemma last night as I had the "wrong envelope" too. So now that I have found the "right envelope", I can begin sharing the Y-DNA test results with my Uncle Ernie and perhaps we can determine the ethnic origins of our immigrant Coffman ancestors. We have several matches already as shown in the following image. 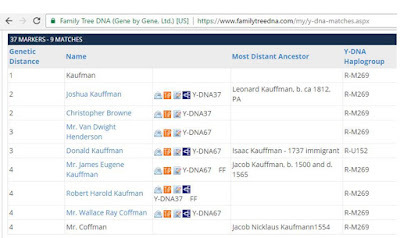 I was also contacted by the co-administrator of the Kauffman/Coffman surname project at Family Tree DNA. 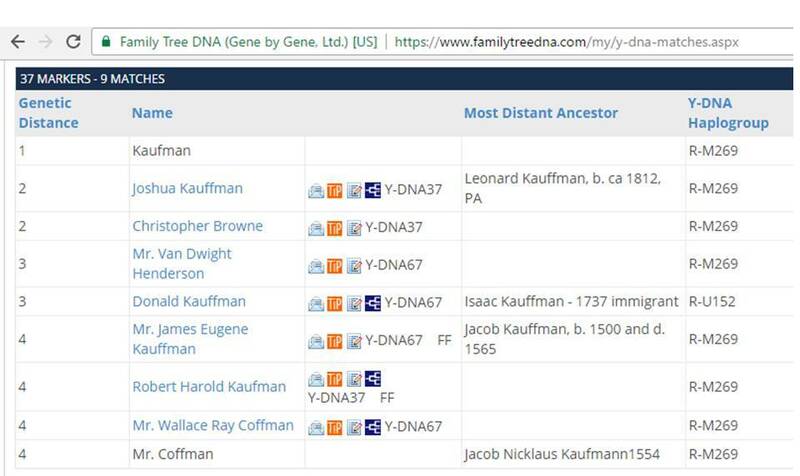 Your new 37 marker results have you matching into the extended Swiss "KFA" Kauffman family tree. Please join your result to the Kauffman/Coffman surname project. Can you provide some information about what you know of your paternal line so that I can fit you into the attached tested KFA result chart?